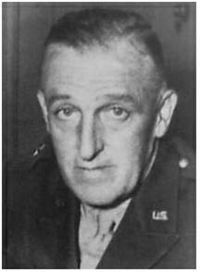 Norman Daniel "Dutch" Cota, Sr. (May 30, 1893 - October 4, 1971) was a U.S. General during World War II. Cota was heavily involved in the planning and execution of the invasion of France, codenamed Operation Neptune, and the subsequent Battle of Normandy. Cota was born in Chelsea, Massachusetts, the Son of George William Cota, a former Railroad Telegrapher (later a local store merchant), and Jessie H. Mason, a local New England School Teacher. Working at his father's store in Chelsea, he got the name "Dutch" from his gang friends from Chelsea Square. This nickname would stay with him for the rest of his life. In the fall of 1910, he first attended Worcester Academy. In June 1913 he was accepted and graduated from the United States Military Academy, at West Point, New York, in 1917. He was commissioned a Second Lieutenant of Infantry, and later return remaining at the Academy as an Instructor (1918-20). He later had duty in Hawaii (1924-28) and graduated from the Command and General Staff School, at Fort Benning, Georgia, in 1931. He was an Instructor at the Infantry School(1932-33) and went on to graduate from the Army War College in 1936. He was an Instructor at the Command and General Staff School (July 1938-Nov.1940). At the outbreak of World War II, he was the G-2 Officer (Intelligence) and then G-3 Officer (Plans and Training) of the 1st Infantry Division, in which he served from March 1941 until June 1942. In June, he was promoted to the division's Chief of Staff, a role he held until February 1943. In February 1943, right after his involvement and success in The North African Invasion Operation Torch, under the command of Major General, Terry de la Mesa Allen, Sr., he proposed a report of an assault division on what would become part of Operation Husky, the allied invasion of Sicily. Having the leadership needed for the moment, he was promoted to the rank of Brigadier General and was quickly sent to the United Kingdom where he served as the United States adviser to the Combined Operations Division of the European Theater of Operations. As an advisor, he helped to observe and supervise in the training of landing operations. As a major advisor in Operation Overlord, he was made Assistant Division commander of the 29th Infantry Division designated to land at Omaha Beach during the Battle of Normandy. During D-Day planning, he was opposed to daylight landings, believing pre-dawn landings would stand a better chance of success; he did not get his way. Cota was not alone in his opposition to daylight landings. General Leonard T. Gerow, commander of the entire V Corps, and Admiral John L. Hall, Jr., commander of Amphibious Force "O" (the naval force responsible for delivery of the US 1st Infantry Division to the beach), both fought to change the Operation Overlord plan, pleading for a night time assault. In spite his suggestions, with time running out and bad weather conditions at the designated invasion sites, prompt the high command little choice.
. . . It is granted that strategical surprise will be impossible to attain. Tactical surprise is another thing however... . tactical surprise is one of the most powerful factors in determining success. I therefore, favor the night landing. I do not believe the daylight assault can succeed. However, the high command concluded that naval and air bombardment would effectively neutralize (at least) or eradicate (at best) the enemy opposition. This reliance on technology, rather than maneuver and surprise, was a salient characteristic of the American approach to amphibious operations. By contrast the British historically had relied on surprise and flanking maneuver. The plan for Omaha, however, essentially called for hurling infantry directly into a prepared enemy position — a position that was enhanced by the concave shape of the beach (effectively promoting enemy crossfire into the "basin" of the concavity), by natural and man-made articles, by bad weather and other factors. The assumption was effectively that American technology would vitiate the need for surprise.
. . . The little discrepancies that we tried to correct [in the amphibious training center] are going to be magnified and are going to give way to incidents that you might at first view as chaotic. The air and naval bombardment and the artillery support are reassuring. But you're going to find confusion. The landing craft aren't going in on schedule and people are going to be landed in the wrong place. Some won't be landed at all. The enemy will [to some degree prevent] our gaining "lodgement." But we must improvise, carry on, not lose our heads. While Cota had a far less sanguine view of the plan than did the higher command, even he underrated the extent of the near-catastrophe that awaited V Corps (commanded by General Gerow and composed of the 29th Infantry Division and the famous "Big Red One" 1st Infantry Division) on Omaha beach and the 4th Infantry Division on Utah beachhead. Cota landed with a part of the 116th Infantry Regiment of the 29th Division, in the second wave, approximately one hour after H-Hour, on the Omaha sector known as Dog White. His boat (an LCVP) was under heavy machine gun fire as well as mortar and light artillery fire; three soldiers (including most likely at least one officer) were killed immediately upon leading the disembarkation. Cota was one of the highest ranking officers on the beach that day. He is famous for personally directing the attack, motivating the shell-shocked, pinned-down survivors into action, and opening one of the first vehicle exits off the beach. Two famous quotes are attributed to him during this time. In a meeting with Max Schneider, commander of the 5th Ranger Battalion, Cota asked “What outfit is this?” Someone yelled "5th Rangers!". To this, Cota replied “Well, goddamn it then, Rangers, lead the way!”. "Rangers lead the way" became the motto of the Rangers. He is also quoted as saying to his troops, "Gentlemen, we are being killed on the beaches. Let us go inland and be killed." Interestingly, in The Longest Day, Cota renders the similar encouragement that was, as the evidence best suggests, actually delivered by Colonel George A. Taylor: "There are only two kinds of people who are staying on this beach: those who are already dead and those that are gonna'die. Now get off your butts, you're the fight'in 29th. With the coast of Normandy eventually secured, the allied forces began to make momentum toward Paris, France. Cota would be given command of the 28th Infantry Division. It was during this time, that most main U.S. Army units, except the 28th. infantry division, were in the field of action. About to receive their field orders, at the last minute, Cota and the 28th Division were requested to march and represent the U.S. Army in the celebration of the liberation of the City of Paris. It was a shining moment for him and his division. Later that year, while on the field, he would be promoted to the rank of Major General. As the commander of the 28th Infantry Division, Major General Cota was involved in the Battle of Hurtgen Forest. Gen. Cota's 28th "Pennsylvania's Bloody Bucket" Division, sustained heavy losses. He and his men did all they could to slow or hold off the direct German assault. During this battle it is documented that even Gen. Cota's Son, U.S. Army Air Corps Fighter Pilot, Leut.Col. Norman Cota, Jr. had provided some overhead army aircorps RECON assistance on behalf of his father's challenged and beleaguered division. It has been first suggested by some historians, that military error of blame between him and the allied high command occurred regarding an incident of stolen intelligence equipment, thus underestimating the German assault plan on the battleline and towards his division, but decades later, Cota's then superior officer, General Omar Bradley said that the missing intelligence equipment in question was not the cause at all, later it was found undisturbed, safe and sound. He also reviewed and approved the death sentence handed down by a court martial on Eddie Slovik, the only U.S. soldier to be executed for desertion since the American Civil War. Cota is said to have approved the sentence because he was (moved and) appalled by the bluntness of Slovik's confession. Cota received the Distinguished Service Cross for his heroism on Omaha Beach. In 2004 a movement arose to have the Army reconsider upgrading Cota's decoration to the nation's highest award for bravery, the Medal of Honor. Both Gen. Cota and his high commanding officer, Dwight D. Eisenhower knew one another from early West Point Days while playing football. They would become and remain good friends with one another. Cota retired from the Army in 1946 at the official rank of Major General. He died in Wichita, Kansas, on October 4, 1971 and is buried in the post cemetery at the United States Military Academy, West Point, New York. He courted and later married first in 1919, Constance Martha Alexander in New York City, who was a writer-teacher and distant cousin to Eleanore Butler Alexander, the spouse of Theodore Roosevelt Jr.. Both Cota and Roosevelt were also distantly related and directly interacted with one another during WWII. He would marry second around 1964, Alice Weeks-McCutcheon. The character of General Cota is played by the actor Robert Mitchum in the movie The Longest Day. Mitchum delivers the famous last line of the film, as Zanuck has Cota order a young soldier driving a jeep to "run me up that hill, son." Actor Robert Ryan, who played in the movie "The Longest Day", would return in the movie "Battle of the Bulge". He (Cota) was under the fiction name of "General Grey." In the movie "Saving Private Ryan", though not officially mentioned, he is mistakenly portrayed by the actor Ted Danson, when he (Cota) appears to his company men during a German sniper incident, where he gives them advice and instructions. This idea/portion was 'borrowed' from "Citizen Soldier" by Stephen Ambrose, who served as film consultant for the film. Though he was given many medal commendations during his career in the U.S. Army, especially during his heroic involvement at "Omaha Beach" during D-Day, he was not given The Medal Of Honor. Over the years, many war historians, and former World War II veterans have thought otherwise. Recently, a petition was filed on behalf of various former veterans and friends to the U.S. Army to re-consider granting him that highest honor. At present, the granting upgrade posthumous, of The Medal of Honor for Major General Cota is "Pending", and under review.